FREE S & H in the usa! Choose NO SHIPPING in the shipping area. Or a free T shirt, put a note in the ORDER COMMENTS area of the size and color for your free shirt (don't order the shirt) if you pay for shipping. 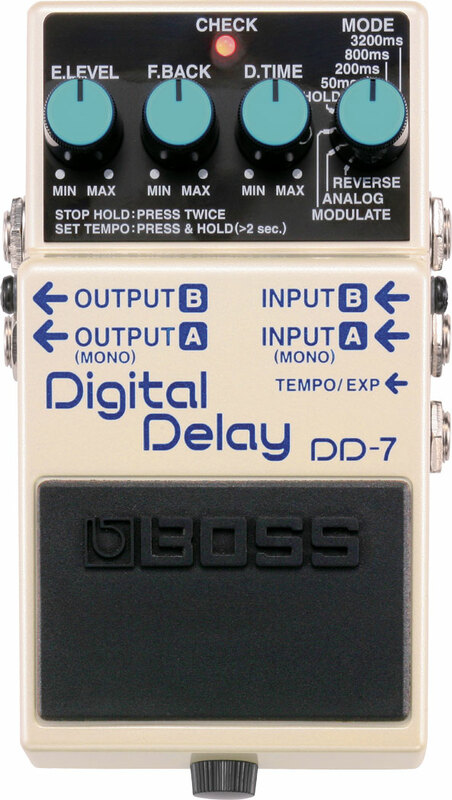 Analog Man carries the Boss DD-7 Digital Delay, one of the best small digital delays, with analog sound option, modulation, tap tempo, expression pedal control, and looper built in! Free S & H in the usa! The DD-7 has an ANALOG MODE, which is a little different from our highcut mods on the DD2,3,5, and 6. Our highcut mod keeps the delays clean, just rolls the top end off for a smooth sound that does not collide with the dry sound. The ANALOG MODE on the DD-7 emulates an analog delay, with distorted repeats which get more and more lo-fi. It also will oscillate like an analog delay with spaceship sounds, while a digital delay just keeps repeating the sounds without them morphing into noise like an analog delay. Delay time, feedback, and/or effect level can be controlled via one external Expression pedal (sold separately). You can program which control(s) you want to adjust with the EXP pedal. One, two, or all three parameters can be controlled and a maximum setting for each parameter can be programmed.